What do you experience when you experience experience? The sailing vessel “Jolly Breeze of St. Andrews” is a 72 foot gaff rigged square rigged cutter. 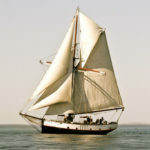 She is a steel replica of the Jolie Brise of La Havre, a vessel of the early 1900’s, famous for winning the fastnet race 3 times consecutively. The “Jolly Breeze of St. Andrews” was built in Whangarei, New Zealand and launched by the late owner builder Mr. Marc Witteveen on Dec 7, 1989. She is a steel vessel, her hull being 6mm thick. Teak, imported from Burma, was crafted into hatches and the rail. A teak deck was laid over the steel, with glass prisms being inserted to give added light below. Oregon pine was the wood chosen for the boom, yardarm and mast. The mast is entirely hollow, giving it extra strength. The interior is a blend of native New Zealand woods, karri and pine, with Burmese teak and some tropical hardwoods. The leather cushions were added whilst in Morocco, along with the antique tiles. Steel she may be but the “Jolly Breeze of St. Andrews” definitely has the look and feel of wood. The “Jolly Breeze of St. Andrews” is well equipped to spend long periods at sea, as she sometimes does. She carries 4 tons of fresh water, a ton and a half of diesel, has a 1 ton holding tank. All tanks are located under the floor giving her a double skin. In 1994 amid 70 entries “Jolly Breeze of St. Andrews” won a prize for Concours D’Elegance in the Antigua Classic Boat Regatta. To date the “Jolly Breeze of St. Andrews” has sailed 20,000 nautical miles voyaging the world. She has seen stormy seas, a time to take the sails down and to heave to, she’s been becalmed for days, she’s sailed 12 days without a sail change, she’s been over on her side when the tide went out, she’s won herself a prize in the Concours D’Elegance class at the Antigua Classic boat show, she’s met river pirates plus a lot of interesting people of the world. The “Jolly Breeze of St. Andrews” is fully Canadian Coastguard approved to carry 46 passengers and 3 crew however we highly value customer service and normally run with 45 passengers and 4 crew. She is equipped with a new super low emission engine which is used during the trip along with the sails. This is done to ensure there is adequate time to reach the feeding grounds of the whales. The engine plus sails allows for a smooth quiet ride, however, if the whales are feeding in one area, then the engine may be turned off to allow for a sailing adventure, wind permitting of course. Every year the vessel is inspected before being issued her certificate to operate. Every 2 years she has an out of the water inspection. Captain and crew must be qualified personnel in their respective professions. There are both adult and child lifejackets on board as well as two life rafts. There is a solid steel guard rail up the adult hip and a life line above that. It is safe to walk around freely on deck. She is equipped with modern safety systems and advanced navigational tools and undergoes an annual Transport Canada Certification. From the moment you board our floating home, your comfort, safety and enjoyment is our goal. Your Hosts, Joanne and Robert Carney, purchased the Jolly Breeze in 2004.
we are able to combine three of our biggest loves… Natural Wonders, Sailing Ships and Smiling People.